Join us mid-term for only $50! Includes 4 x 45 minute classes and your digital home materials. Call M:0415 482 264 or email Verna at verna.hewitt@gmail.com to check if places are available in your preferred class. Click here for more information about what we do in class for each age-group. Friday 11.00am – Unit Theme: Bluebird, Bluebird Chirp! Tweet! Quack! Bluebird, Bluebird is a sound-rich journey into the sky, where you’ll explore birds, feathers, and the outdoors. Join the birds as they sing, tweet, and peck around in springtime; hear the sounds of bees and baby birds coming alive in the summer; and follow the flight of the wild geese in autumn. Vocal play is our focus in this unit. We will use the sounds of birds and other animals to help to develop baby’s hearing and emerging vocal skills, and we will introduce sign language to further enhance the communication between baby and caregiver. ** Friday 9.00am is a family-friendly class catering for ages 0-5 years. Where can you go to see pirates, castles, dragons, dinosaurs, and more . . . all in one place? That’s easy—your imagination! Climb aboard the S.S. Pretend and set sail to imaginary places in the land of Make Believe. You will dance the pirate’s treasure dance, visit Royal Island and the castle of a king and queen, and even meet a friendly dragon. 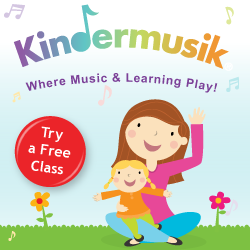 Join an existing class for a FREE Kindermusik Preview lesson – there is no better way to find out what Kindermusik is all about. Click here for more information. Bookings essential. Next Post Music2Grow is coming to Nambour in 2014!